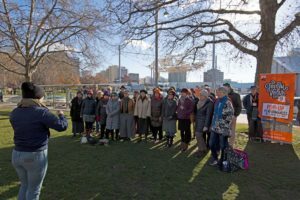 Here is a glimpse of choirbolical’s Festival of Voices experience in Hobart 2017. Pop up performances at markets, concert appearance at Town Hall and hanging at the Singer’s lounge where choirbolical took to the stage AND Joe, Alison and Astrid gave blackboard performances to great applause; AND not forgetting a memorable rendition of Carole King’s Natural Woman led by Astrid. A fabulous time was had by all 30+ of us. ( Not so fabulous was the flu many of our travellers came down with afterwards.) Hopefully most are on the mend for the resumption of rehearsals this week. See you there. Astrid’s ‘500 miles’ blowing the audience away! ACTIONS– show of hands @ rehearsal of singers willing to go / Rebecca to email Chrissie M and Susie F to see if they are willing to help conduct. ACTIONS- a) Marion to add dates & details to website b) Kent to contact Elaine to confirm with Elaine. Suggest Elaine and Astrid be in touch directly with each other and choose a piece of music to exchange. Next VOCE confirm proposal – venue (CUA or too small? )/ money raiser?/ charity concert? Etc. Christmas Wonderland: Suggestion that if we participate, our final rehearsal could be Tues 5th December and we offer to walk over and sing a bracket of songs at 8pm. Break-up? ACTIONS- Check with Astrid if willing/ Marion remove 19th Dec rehearsal from web calendar. 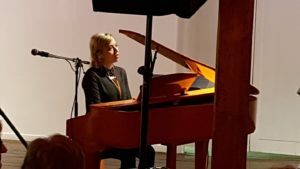 FOV-Festival of Voices wrap up: a) Payment for Astrid – ACTION – Catherine to follow-up with Astrid b) Report and photos to go on the website. ACTION – Marion to compile report and ask Astrid about photos. c) Andrew to talk at next rehearsal. C) Thankyou to Anna Goldsmith for coordinating communication ACTION– Pam to organize card/ Gail to get flowers for next rehearsal. Amplifier & Risers: Stuart to discuss with Astrid possibility of using an amplifier (hire/borrow to trial). Catherine to check Owen’s Photography portable risers & Stuart other possibilities to give portable height to back row. Name Tags: Pam to get blanks from Judy and have available for new members from next rehearsal. Encourage everyone to wear? Emails on Website: who receives and replies to comments/ emails on website. Astrid?? 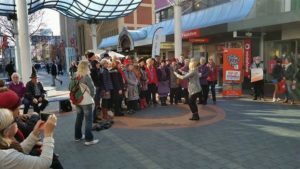 SING into SPRING @ Walton’s Store Stage September 9th – suggesting a later time 12.30 pm or 1pm ACTION: check with Astrid & Pam to check out the market at these times. Lesley to ask about requirements needed to put photos or advertise our performance on the screen. PHOTOS: a) CUA concert photos taken by Nev Madsen ACTIONS: Pam to get thankyou card/ Lesley to get bottle of wine/ Gail to give them to Nev with our thanks. Marion to ask Astrid about choosing files for the website. CUA have requested photos from this performance and from FOV to include in their newsletter? b) Just Us Choirbolical facebook created by Chris – some photos there can we choose and add some to website which is more accessible for all. Are there more photos out there? Astrid? New Repertoire; look forward to new music for performances for the rest of year. Theatre Restaurant – choirbolical table @ theatre restaurant in Ipswich with Clive and Alison? Clive and Alison to bring fliers. 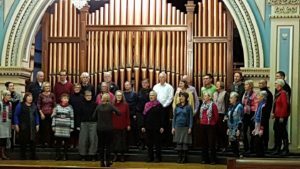 VOCE meeting at Pam Wilson’s house 15 Argyle Street Tuesday 25 July 6:30. Choir rehearsal will resume 1 August usual time and place. No VOCE tonight, too many people still not well enough. As Astrid is not going to be able to attend tonight and as many of our members are still crook as well, please watch for a follow up email today before you come to rehearsal tonight. Rehearsal may be cancelled. I am awaiting feed back from others to make the decision. Astrid was going to introduce new repertoire and we really don’t have a lot to do. I want to suggest that anyone wanting to participate with VOCE at Park House tonight, that might be an alternative. More as know. A gentle reminder of our next rehearsal: Tuesday 18 July, 6:45 for a prompt 7:00 start.